The name Lola Olufemi may be familiar to you. She made headlines in the latter half of 2017 when she co-authored a letter calling for the English department at Cambridge University to decolonise the syllabus by adding more writers of colour. Lola was on the receiving end of a protracted campaign of both racist and sexist abuse for daring to stand up and challenge the way things are done. At a university of all places! There were, I imagine, many sympathetic people to be found in the SOAS Students’ Union during those weeks. SOASians naturally tend to side with the underdog, but more than that, the issue of decoloniality is very important within the SOAS community. The SOAS Students’ Union had experienced its own media firestorm months earlier when false reports circulated across the British press that they were advocating that all white thinkers be dropped from the curriculum. It was therefore a no brainer to hold a joint discussion on decolonising efforts in Cambridge University and SOAS which featured Lola Olufemi and Halimo Hussein, who is Co-President of Equality and Liberation at the SOAS Students’ Union and an active member of the Decolonising Our Minds Society, a student-run organisation that challenges colonial legacies within and outside of the university. The abridged discussion below, organised by the Centre for Gender Studies as part of its popular lecture series, focuses on the debates circulating around decolonising education in England, which include questions of curriculum review, recruitment and policies in higher education. Far from being a single-issue concern, the discussion centred the fact that decolonisation is in fact a conversation that involves a constellation of actors, which ultimately challenges the foundations of what the university is and the power relations that sustain the hierarchies that shape knowledge production and consumption. The conversation was led by Dr Awino Okech, a lecturer at the Centre for Gender Studies. Let’s start with your histories. 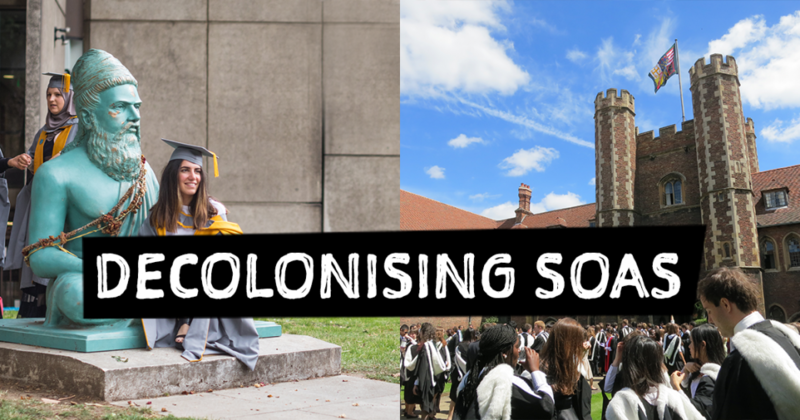 How did you both come into the conversations on decolonisation in your universities? Lola Olufemi (LO): I studied English Literature at Cambridge and graduated in July. One thing I noticed was the experience of women of colour, particularly at Cambridge, is one of isolation. The university is decentralised and the way it is structured makes you think the only thing of importance is your weekly essay and academic work. Distance is created between the student and the outside world. For the first two years of my studies, the syllabus was focused on grounding the English canon. We were reading Hardy, Dickens, Pope and Swift, but not discussing the history of empire and the context in which these works emerged from. The department likes to market the weekly essays as an opportunity for students to explore any themes they like, but the practice differed. When I tried to bring in decolonial thought or feminist perspectives, I would be singled out as a problem, someone who was trying to be a disruptive force. There were small and large signals, like feedback saying “this is interesting, but English is not a political subject.” We didn’t talk about history, context, philosophy; English was taught as an individualistic subject, not connected to wider structures. Through the women’s campaign and their weekly forum organised for women and non-binary people I found a place of solidarity. I also got involved with FLY, a network for women and non-binary people of colour, and found a common experience of racism within academic institutions. It was in these spaces, outside of academia, that the campaign was born. I co-wrote a letter to the faculty, and then went to defend it to the board. Sat in a room with the course conveners, they quickly got defensive and reaffirmed their commitment to diversity in the curriculum but this wasn’t true. The experience made us reflect on what it meant to approach those in power, ask for changes but receive piecemeal offerings like sticking someone at the end of a reading list or being told there wasn’t enough money to hire another person to teach post-colonial thought. It was a twofold reflection, as we had done the necessary critical thinking, but then had to find ways within the institution to make sure the meaningful work we had done wasn’t lost in the neo-liberal changes employed by the university in order to appear diverse. The feminist spaces I was involved in helped me to bridge the gap, as decolonising is a feminist project with links to capitalism. My involvement in these spaces gave me the confidence to campaign, but then mainstream media manufactured a story to distract from the work we were doing even though we were already in conversation with the faculty. Halimo Hussein (HH): I got involved with SOAS’s Decolonising Our Minds Society in January 2015, a group created out of students’ frustrations with the lack of representation in reading lists. I currently work in the Students Union with a working group that sits within the university and management is quite involved in it. My role helps to envision what a decolonised institution should look like, with the main focus being the impact of colonialism, imperialism and racism on the institution and the experiences of students of colour. This interrogation involves examining the racialised hierarchies of curriculum, employment and how the university reproduces these systemic inequalities. AO: How would you respond to people who argue that you are in the heart of London and centre of the British empire, what do you expect when you are studying within old, traditional institutions? Why should it be a shock that the curriculum and narratives about other contexts remain shaped by colonial attitudes? HH: I find that these arguments are always framed around exclusion by people invested in societal structures that they benefit from. I frame my responses around inclusions and the value of thinkers from the Global South. It’s not about removing or replacing white philosophers with thinkers of colour, as that approach can feed into a tokenistic attitude. Decolonising is much more than a reading list, it’s about developing critical consciousness and radical subjectivity. That can only emerge out of broadening understanding of knowledge and the pedagogy behind this. LO: And history is a part of this. It is intellectually dishonest not to reflect British history in its entirety, including empire. This doesn’t reflect the experiences of BME students and those outside of academia, which contributes to a whitewashing of history. We are just asking to be reflected in our institutions, because we constitute the history of this country as much as our white counterparts. Part of this is seeing how different discourses work together or against each other to create wider critical conversation. This is what pushed us to write the letter – it’s a betrayal to go through education and never be asked to consider perspectives from the Global South. This is how the repercussions of empire are present in institutions; we owe it to thinkers for from the global south and engage with them critically. AO: Earlier Lola, you spoke about engaging decoloniality through your writing, but you were told your approach was not the right way. What was the right way? LO: English is taught as an apolitical subject at Cambridge, which is an old idea perpetuated by theorists like Harold Bloom, who believed that bringing your subjectivity to the text weighed it down. The text becomes burdened with race or gender and this can prevent the clarity of seeing the emotional truth when reading. The ‘right way’ was an objective, distanced approach. We were taught literature like it was maths, with no personal opinion, or advised to couch our own opinions with established critical voices to legitimise them. This stems back to when English was first taught as a discipline at Cambridge. It was modeled on the sciences to try and authenticate its status as a subject; this involved a distance from the self. But it’s a fallacy that our subjectivity does not influence what we read or learn. AO: If we think about resistance and the conversations around student unions and how they mobilise to shift problematic practices within institutions, do you hear about the right or wrong way of doing things? HH: That hasn’t been my experience; there’s been little pushback. As our focus is to amplify the voices of students and academics, we acknowledge that this is a process that happens slowly, but generally the response has been quite positive. When you’re embedded in the institution and trying to decolonise it, problems do arise, like cooptation and appropriation of decolonising language. I believe that the university can never be fully decolonised unless it’s free and accessible for everyone. Part of our project is developing a toolkit to give to departments, to help decolonise reading lists which is driven by calls from students. For example, students in the post-colonial department helped put together a reading list and gave it to the course convener who implemented their suggestions. There is also a worry about a top down approach to change, but all of these processes tend to stem from radical organising that is student led and bottom up. LO: The increased market driven nature of universities means that they are all in competition with each other. This attitude leaves little space for decolonising arguments. When you enter rooms of those higher up, you see the frameworks that you have to navigate to achieve change, which affects academics as well as students. AO: What is the nature of conversations you are having about critical pedagogy? HH: It involves a focus on professors as well as reading lists. One of our projects is pushing for positionality workshops that look at learning and teaching from a decolonial perspective, interactions in classroom and how that plays out in experience and how we learn. LO: One of the letter’s requests was to ask for funding for a new position in the post-colonial department, as there were only two people who were supposed to cover the Global South. The Students Union is also pushing for implicit bias training, particularly with marking and assessments. Although essays are made anonymous within humanities departments, it is easy to identify who is writing, especially if students bring in an alternative perspective. These approaches are often called too narrow, but if you write three consecutive essays on white male writers – it’s not an issue. These are some of the conversations we’re having with students, as well as faculty members. Another conversation we have is about access to Oxbridge. Mainstream media is obsessed with these institutions, particularly after MP David Lammy said that these universities are a form of social apartheid for their minimal admission of ethnic minority students. I think that this kind of educational disparity happens long before university and any kind of meaningful change has to come before we get to these institutions. For me part of that would be the abolition of private schools. Even if we do get more black and brown students into Oxbridge, the conversation needs to extend beyond this. When they do get there, do they have the support they need? Why do students of colour create spaces of support and solidarity, have highest access to counselling services, are less likely to get firsts? It’s because they are unrepresented and excluded in curriculum, supervisions and social spaces. These aren’t new arguments, we know the institution fails, but it’s how we counter this. We expect the university to have some sense of the experiences of students, from mental health, racism and feminist solidarity. This contributes to retention levels and how well people do in their subject; the more people see themselves in what they’re studying, the more people engage. HH: I recently read an article about the abolition of universities that shared some of the same arguments put forward for the abolition of prisons. It spoke about how both institutions are used to sort society into the desirables and undesirables. AO: Decolonisation has often become narrowed to changing a syllabus, which then becomes a code word for “diverse” names in the syllabus. What do you think words such as diversity do? Is it enough to say let’s just change syllabi? What happens when people use these words interchangeably? LO: Speaking of the co-optation of language makes me think of meetings with people in the leadership of the university, particularly when people use the world intersectionality. It’s crucial to examine the use of this language and what it does for people in power. In a way, it lets them off the sense that they have to do the critical thinking that underpins the work of radical change. It’s chilling, in a way, when something deeply meaningful is co-opted and how this contributes to a disconnect between the origin of this thought and that situation where people aren’t having the conversations. There are a number of small pockets of radical organising that happens around Cambridge. These spaces provide the opportunity for shared emotional labour as well as knowledge production, allowing us to talk about everyday violence and share experiences. These keep you going, as do reading groups, forums and solidarity spaces. These events make the burden of existing in the institution so much easier, as we can come together share what has happened and ask “how do we change it?”. 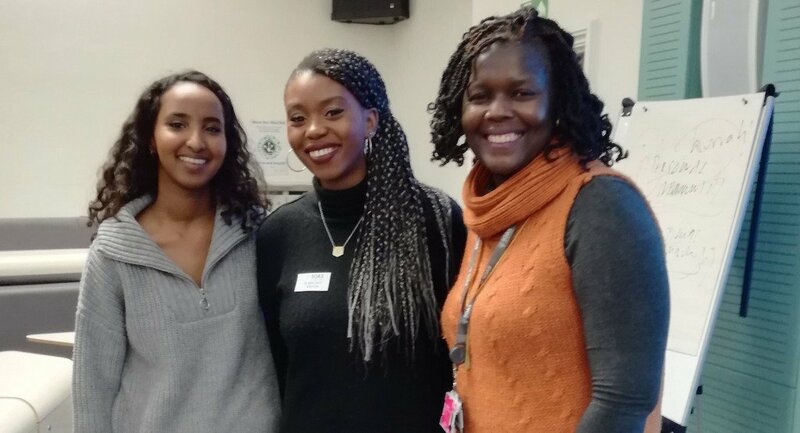 A lecturer in the sociology department – Dr Monica Moreno-Figueroa – makes sure students of colour are always the first ones to speak in seminars. She reconfigures how a room operates, recognising that some students feel more confident speaking up, but tries to make spaces where students of colour feel like they have ownership of the space. Universities are spaces of high turnovers of students, but if you can leave something behind, people find that and have strength to carry on. Follow Lola and Halimo on Twitter and keep the conversation going. For the next seminar in the Centre for Gender Studies series, visit the SOAS website. Transcript by Jennifer Brough, MA Gender Studies candidate 2017/18.